The Future of Food is Bleak. Here’s How We Can Leverage the Private Sector to Face It. This post originally appeared on The SEEP Network. 821 million people are undernourished. Mounting pressures on natural resources threaten sustainable of food systems. Increasing conflicts, crises, and natural disasters are disrupting the access and availability of food. High-input, resource-intensive farming systems are causing massive deforestation, water scarcities, soil depletion, and high levels of greenhouse gas emissions and cannot deliver sustainable production. Increasing urbanization is causing a loss of 2 million hectares of arable farmland per year. Urbanization results in fewer people remaining on farms, painting an uncertain future for agriculture. Prevailing trends suggest a need for transformative change in agriculture and food systems worldwide. Innovative solutions can increase productivity with fewer and aging farmers. And the private sector can play a major role in reforming agriculture production by cutting down on food waste and transitioning to better nutrition. Before we dive into how the private sector is the linchpin to improving food systems, let’s start by defining a food system versus a food environment. The food environment is what mediates an individual’s food acquisition and consumption with the wider food system; it includes the availability, accessibility, affordability, desirability, convenience, marketing, and properties of food sources and products. Like an inclusive market systems approach to development, which works with many market actors, the food system approach works with similar actors, such as smallholder farmers, agricultural input suppliers and traders, food processors, consumers, governments, and civil society. 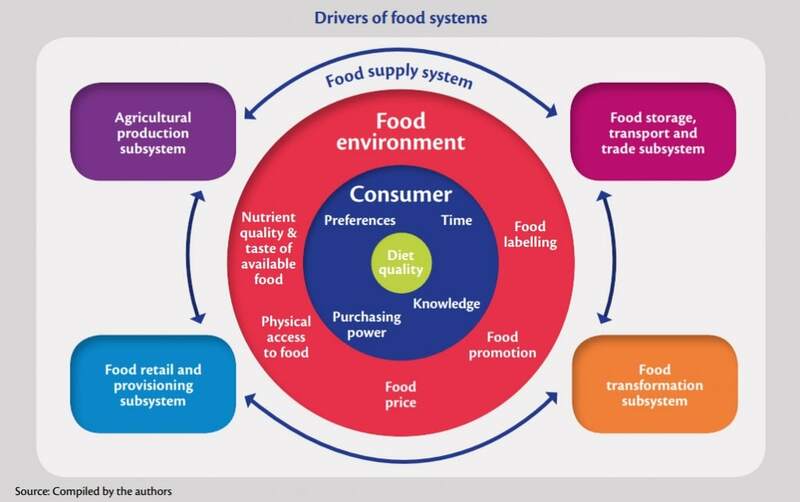 A food systems approach looks at the food environment to improve the conditions driving individual diet quality. Diet quality is often the point that brings nutritionists in conflict with the private sector. With the rising demand for prepackaged convenience foods, which are typically higher in fats and sugars, we often blame the private sector for prioritizing profits over healthy diets. We also fail to see the potential synergies that can come from collaborating with food companies and leveraging their expertise. When we try to control the quality or content of nutrition messages, we sometimes lose focus on the power of the private sector to sustainably improve nutrition on a large scale. What would the future of food look like if we engaged with the private sector as a linchpin for everything from creating sustainable, innovative agriculture, driving the demand for good nutrition, and redistributing food to barren areas to positively shaping the food landscape and spreading nutrition messages? Join me at the 2018 SEEP Annual Conference on Tuesday, October 2, from 2:15 p.m. to 3:45 p.m. as I discuss the private sector’s role in changing the food environment to improve nutrition alongside experts from Tanager, an affiliate of ACDI/VOCA, the Global Alliance for Improved Nutrition, and Sanku. Come and learn with us as we dig into some of the exciting solutions, challenges, and motivators of engaging with private sector.